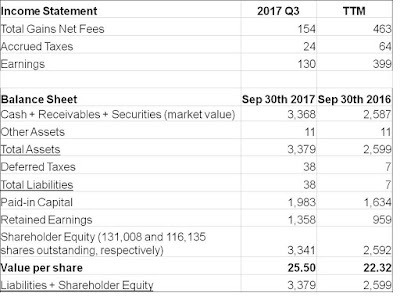 For the third quarter ended September 30th, 2017, KVF gained $0.99 per share, increasing the value of each share to $25.50. This result was about in line with the indexes usually quoted here. But it was a better quarter for the fund than the headline number would indicate, as the strong Canadian dollar hurt returns by $0.33 per share. Currency effects are likely to continue to play a large role in quarterly results; but over the long term they have tended to cancel out to a large extent, and that remains the expectation going forward. Excellent returns from Alliance Aviation (as discussed here) have played a significant role in KVF's recent returns. KVF's portfolio also benefited from a now-exited small position in Triple-S Management. Detracting from recent returns was an investment in Torstar, in which KVF no longer owns any shares. Recent result were not consistent with my investment thesis, suggesting I had made a misjudgement/mistake. Finding value in today's markets remains challenging. It's difficult for me to believe that the returns of the past few years, both for the general markets and for KVF, can be replicated over the next few years. But I have felt this way for some time and yet both KVF and the markets have continued to deliver strong results, so who knows what the future brings. 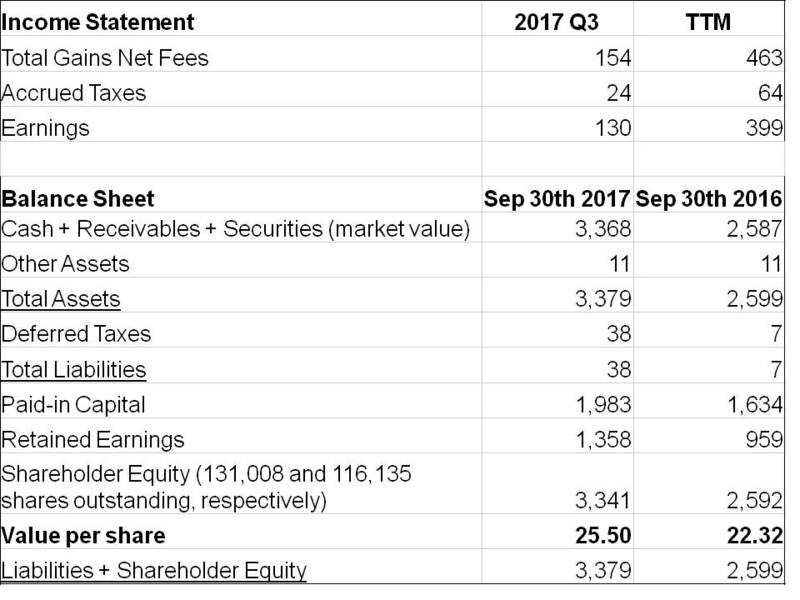 In my opinion, KVF's portfolio continues to have a margin of safety, but it's not as large as it once was, at least by the crude metrics I use. How do you measure your performance as an investor? Do you just compare yourself to an index? For instance, say I pick 10 stocks, 9 go to zero, 1 is a 20x like Amazon. I've doubled my money overall. 100% return, does that make me a good investor? Personally I would look at the average annual return over an investor's long-term track record (10+ or even 20 years). This has the benefit of reducing the effect of bets that were lucky/unlucky and should also outlast most fads. The downside of course is that it takes a really long time.